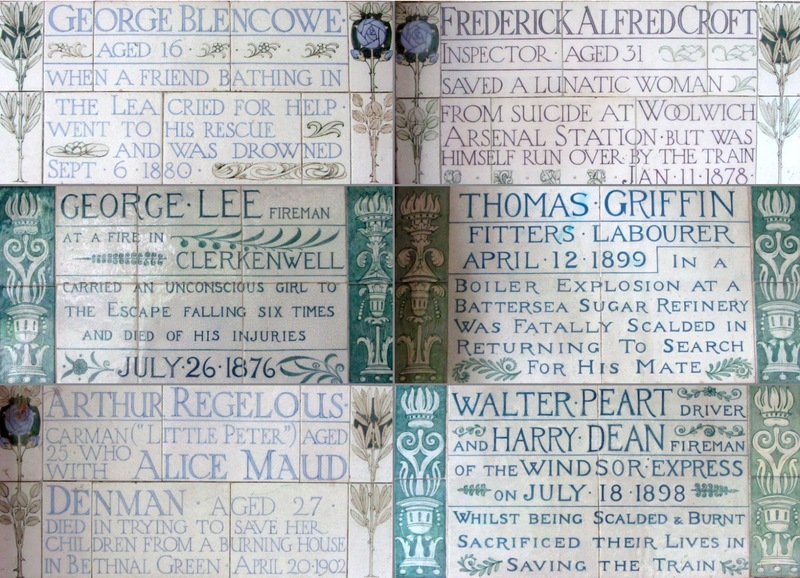 "... Victorian memorial plaques she came across in a London park"
No recognition has been made as to where the original marvellous handmade tiles can actually be found. Susan's photographs are arranged in nothing like the same configuration that they are in their actual location and the quality of the prints looks to be a bit dark and over-inked. It amused me to see that people visiting the gallery are taking photos of these photos. Go figure. 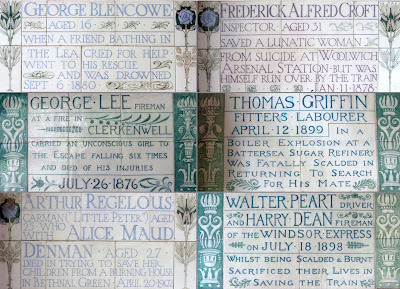 For those of you who don't know, these Doulton tablets form part of Watts memorial within Postman's Park, a stone's throw from St Paul's. I took some photos of them a while back when I'd gone to enjoy the peace and quiet in this lovely little garden space and have put six of them together here – does this make me an artist?